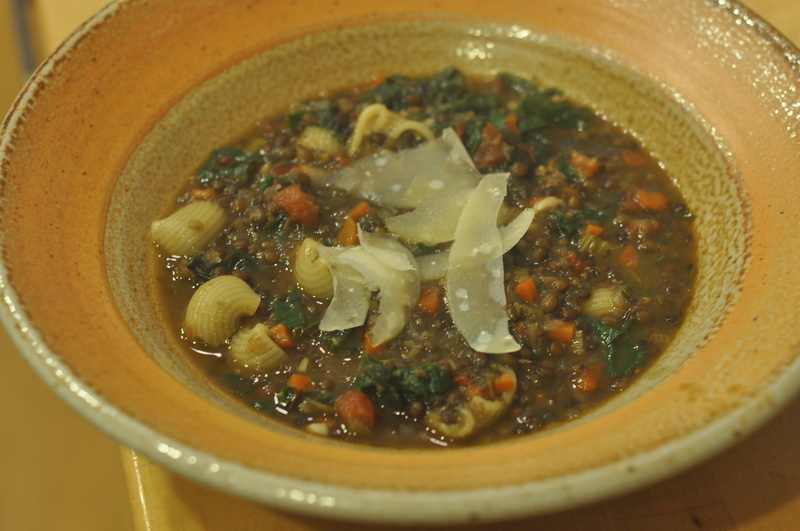 Deborah Madison’s recipe for minestrone soup with lentils was perfect for what turned out to be a cold spring day. Some weeks ago I’d bought some black beluga lentils — “the caviar of beans,” according to the bag — and left them sitting next to my bowls of onions and garlic on my chopping table. And yesterday, when we were all in the mood for a warming dinner, I flipped through my cookbooks for a lentil soup. Lentils, because of their small size and thin seed coats, cook faster than most other beans. But because it was a first-time recipe, it took me longer than it should have to get the soup on the table, and by the time I was ready the NBA play-off game that The Professor had planned to watch last night had already begun. Nevertheless … he gave the dish an A- — a rarity for a first attempt! The Professor liked the flavors. 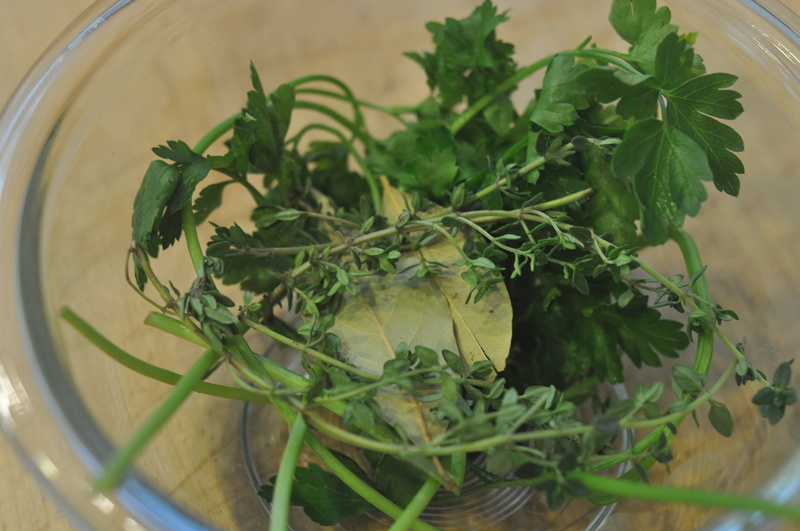 The recipe begins with cooking the onions until they brown and that, combined with a generous amount of garlic, lots of diced carrots and celery and a good handful of bay leaves, parsley branches and sprigs of thyme, gave the broth a richness that is often missing in vegetarian soups. He also liked the different texture of the pasta, which I’d cooked separately, run under cold water a minute shy of its full cooking time, and and then added to the soup before serving. Heat the oil in a wide soup pot with the onion. Saute over high heat, stirring frequently, until lightly browned, about 10 minutes. 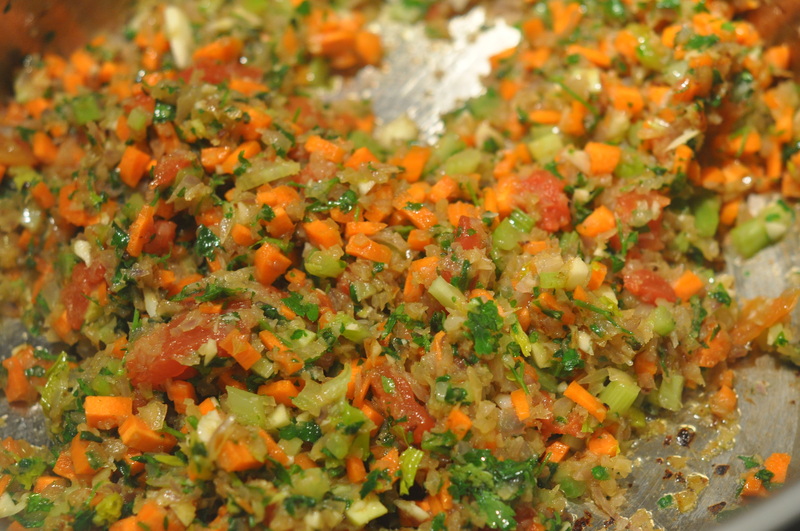 Add the tomato paste, parsley, celery, garlic, vegetables, and 2 teaspoons salt and cook 3 minutes more. Add the lentils, aromatics, and water and bring to a boil. Lower the heat and simmer, partially covered, for 30 minutes. Taste for salt and season with pepper. If it needs more depth, add mushroom soy sauce to taste, starting with 1 tablespoon. (The soup may seem bland at this point, but the flavors will come together when the soup is finished.) Remove the aromatics. Just before serving, add the greens and the pasta to the soup and heat through. Serve with extra virgin olive oil drizzled into each bowl, a generous grind of pepper, and the Parmesan.